Traditionally, implant surgery consisted in a highly expensive, multi-stage process which lasted about 18 months and implied bone grafting, bone graft healing, implant placement, implant bone incorporation and finally insertion of the prosthetic bridge retained with screws. Fortunately, things have evolved in dentistry and today patients can receive a prosthetic bridge in just 1-2 days after the removal of broken down and decayed or loose teeth. The "All on four", is a modern dental implant technique which allows for the bridge to be stabilized by only four implants, rather than the standard eight. The difference to the conventional implant method lies in the sinking angle of the two rear implants in length, which are screwed in on a 30 degree angle. Since implants with a length of up to 18mm are used with this technique, they must be of an angle of up to 30 degrees to avoid any evasion of the maxillary sinus. The implants are subsequently inserted in a rear direction of the upper jaw. 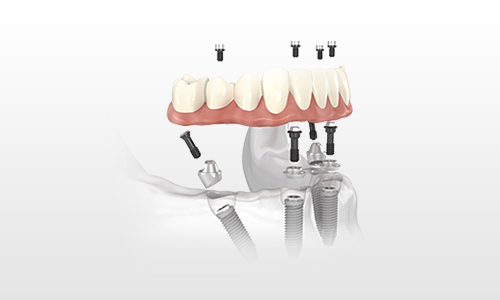 In short, the "All on four" technique is a same-day procedure which offers edentulous patients fixed, non removable false teeth with reduced costs and maximum confort. A couple of days after the first stage of the bridge process, the patient will receive be the permanent fixture. The remodelling contains a steel or titanium stand, or optionally a full ceramic base (zircon oxide), which is less susceptable to plaque, compared to acrylic bases. Porcelain teeth are recommendable as they don’t stain, chip and break. Of course, there are general recommendations in dentistry, but each case should be treated differently, according to patient’s specific situation. In our clinic, each client is carefully consulted and the treatments are thoroughly documented and customized, so that everybody receives the most durable and esthetically pleasing dental implant. Usually, after the procedure, special hygiene instructions are recommended: the patient is advised to see their hygienists each month to learn how to care of the new bridge and implants. 3months after the procedure, the dentist will also check if the procedure has been successful and the implants have become integrated into the bone. Also, to achieve best results for this modern missing teeth solution, an annual clinical review is required, with repeat panoramic x-rays. If you have missing teeth and your dentist informs you that you are eligible for the all-on-four implant technique, consider yourself lucky. With this unique dental implant innovation, you will be able to bite and chew any type of food and your smile will look great.